Greece is a country with no significant historical connections to Nazism. "Golden Down", the neo-Nazi organisation created in 1980 and turned into a political party in 1993, used to enjoy the support of just 0.07% of Greek voters (national elections 1996). Then something happened – Golden Dawn was bolstered, among other reasons, by the anti-European sentiments spreading among the Greeks who suffered from the harsh austerity measures imposed on them during the long economic crisis which has afflicted the country since 2008. In the elections of September 2015, GD became the third party in the Greek parliament with 6.99% of votes – a deadly threat for migrants, Roma people, and LGBTQ people as well as an embarrassment for all democratic and antifascist Greeks. You can follow the news from the trial that has been described as ‘the biggest trial of fascist criminality in Europe since the Nuremberg process at the end of the Second World War”, to quote Kevnin Ovenden, in GoldenDawnWatch and the “Internattional” section of JailGoldenDawn. The two initiatives are run by lawyers and journalists and provide updated material for the legal procedures in English and other languages. Just a year and a few months before the early national elections of January 2015 (when GD got 6.28% of votes), GD members had killed rapper Pavlos Fyssas, 34, a beloved, influential figure in the hip-hop community of the West suburbs of Athens. 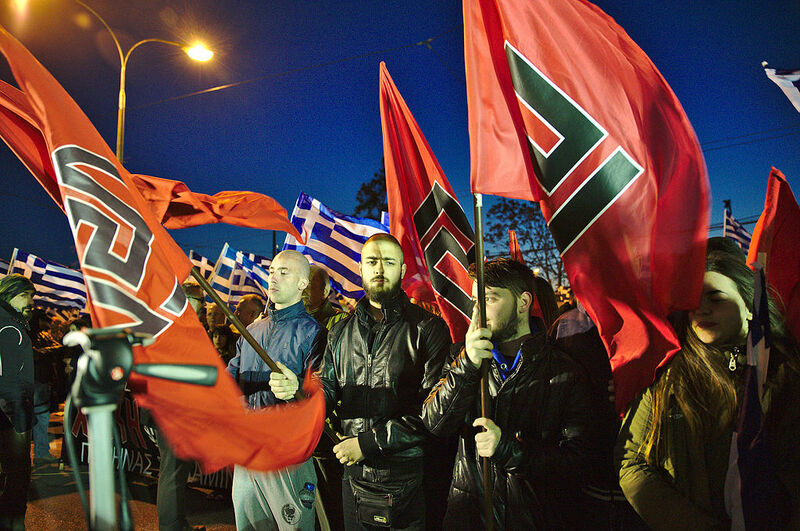 Public opinion was shocked – but Golden Dawn is still popular on the Greek political scene. Pavlos Fyssas was stabbed in the heart, in cold blood, by GD member Yorgos Roupakias. Fyssas, who was hanging out with friends in a café in his West Athens neighbourhood, was noticed by another member of the local GD branch. Soon, over 40 members were summoned by text in the area. They were armed with brass knuckles and initiated a verbal conflict with Fyssas and his group. Roupakias did not hesitate to drive against traffic, park his car in the opposite lane, and get off openly holding the knife, ready to kill. He was arrested a few minutes later by police officers, who had been standing nearby but failed to intervene. When caught, Roupakias reportedly said “I am one of yours”, expressing the perceived political and ideological bonds between GD and the police forces. Following Fyssas' assassination on September 18th, 2013, the entire GD parliamentary group was arrested, along with many junior members. The leadership stayed in custody for 18 months, while the trial began on April 25th, 2015. The trial also concerns the attempted murders against fishermen of Egyptian origin and trade unionists affiliated with the Greek Communist Party. GD has used the trial and custody of its leadership to portray itself as a movement of “persecuted activists” and reaffirm the connection to its ideological lineage. From leader Nikos Michaloliakos, who during a 2015 radio interview admitted political responsibility for Fyssas' murder, to the GD members who shouted “where is your son now?” at Fyssas' mother during the trial, some pride themselves in the murder. At first glance, GD’s power and popularity seem unaffected. “I wouldn’t agree”, says to OBCT Vassiliki Georgiadou, associate professor of Political Science at the Panteion University of Athens: “We need to take into account the electoral power GD had the year before and until the murder. According to reliable market research and opinion polling agencies, GD had double figures in the polls with an upward trend. This stops after the murder and especially when the judicial investigation began”. As the above-mentioned rates prove, though, GD has maintained the support of around 7% of the electorate. “Of course, GD’s political base has now been stabilised”, explains Prof. Georgiadou. “Qualitative and quantitative data show that its supporters have voted for it more than once, which indicates the existence of a stable tank of supporters. But the masks have fallen – while GD was initially supported by protesting voters, these moved back to New Democracy or minor political parties after GD exposed itself as an extremist, violent organisation”. Writer, politician, and scholar Savvas Michael, general secretary of the extraparliamentary Marxist left party "EEK" (Worker's Revolutionary Party) and a widely respected figure of the radical left in Greece, agrees. He lists the reasons why GD has kept the support of the 7%: “GD remains unpunished, but not unscathed. However, the sociopolitical and ethical crisis in bankrupt Greece, along with the disappointment from the SYRIZA-ANEL government, clear the ground for fascist populism”. Michael also highlights how the police covered for GD: “Vulgarities against Fyssa’s mother, intimidation of witnesses, and other brutalities of GD members inside the courtroom remain unpunished. Instead, the police throw tear gas at the anti-fascist crowd into the courtroom”. Since the Greek Constitution forbids banning any political party, it is up to the judges to prove that GD is a criminal organisation. The consequences of this decision will affect Europe as well as Greece. “The trial is also important for postwar Europe in general, where political parties – even extremist ones – do not usually exceed the constitutional and democratic framework”, notes Prof. Georgiadou. However, unlike the neo-Nazi group that killed members of the Roma minority in Hungary (trial 2011-2013) and the NSU undergoing trial in Germany, Golden Dawn enjoys a paradoxical institutional legitimation. History, if forgotten, strikes back.